Description: Decorative Dutch Golden Age county map, with elaborate cartouche and Coats of Arms. French text on verso. Coloured. Description: County map of the whole of Yorkshire peculiarly without a title. There is a line on the lower margin announcing the map. The dedication is the Charles, Lord Fairfax. Description: Ferrybridge to Barnard Castle, via Wetherby, Rippon, Boroughbridge, Richmond and Wakefield. Early road map in strips from John Ogilby's landmark atlas, "Britannia". Coloured. Description: County map North and East Riding. Ornate title cartouche. Coloured. 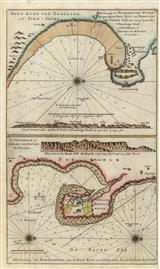 Description: Two copper-engraved sea charts on one sheet, showing Scarborough and Hartlepool. Coloured. Description: Grand map of Yorkshire with informative and descriptive text. Cartouche highlights the importance of trade to the county. Original colour. Description: Yorkshire. Miniature county map. Coloured. Description: Southern part of the West Riding. Elegant and detailed county map with a compass rose and subtle original colour. Title: : Pontefract: Plan and Survey of Pontefract Race Course. 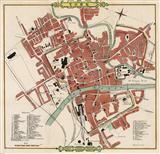 Description: Pontefract: Plan and Survey of Pontefract Race Course. Steel-engraving, original colour. Description: City plan of Bradford with decorative vignettes of landmarks in the city including St. Peter's Church, Airedale College and the Bradford and Halifax Railway Station. Coloured. Description: York. Charming town plan noting major roads. Reference columns mark Churches, Chapels, and Public Buildings. Original colour. Description: Geological Map of West Yorkshire and Lancashire & East Yorkshire from Stanford's Geological Atlas. Printed Colour.